In 1777, the Marquis de Lafayette (1757-1834) then aged 20, sailed to America on his own funds without the consent of King Louis XVI. He was commissioned Major General in the Continental Army by the Congress following his request to serve General George Washington without pay. 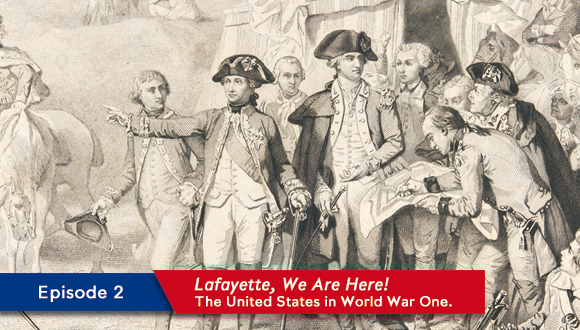 In 1779, King Louis XVI named Comte de Rochambeau Commander-in-Chief of the French Expeditionary Force that sailed to fight in the American Revolution Wars and commissioned Lafayette to inform General George Washington of the arrival of the French forces. On 13 July 1780, some 4 000 troops commanded by Comte de Rochambeau began disembarking in Newport Harbour, Rhode Island. 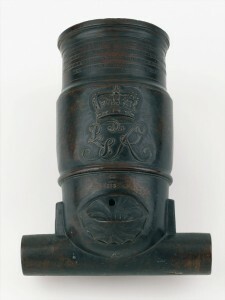 British mortar cast around 1740 presented by General George Washington to the Royal-Auvergne Regiment in recognition of its participation the American War of Independence following the capture of the redoubts during the Battle of Yorktown. © Paris, musée de l’Armée, dist. RMN-GP Pascal Segrette. The main objective of the siege of Yorktown (Virginia) was to trap Lieutenant General Charles Earl Cornwallis’ army at Yorktown and force him to surrender his troops. The British general was expecting reinforcement from the Royal Navy but the ships never came. On 5 September 1781, French Rear Admiral Comte de Grasse made a strategic victory during the naval Battle of the Chesapeake by drawing the Royal Navy away from the area, thus eliminating all potential reinforcements for the British positioned at Yorktown. On 28 September 1871, a state of siege ensued that cut off all supplies to the British troops. 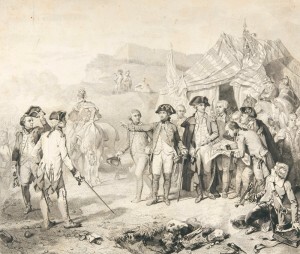 The mixed Franco-American force consisting of the troops led by Comte de Rochambeau reinforced by the contingent of Rear Admiral de Grasse and the troops of the Continental Army led by General George Washington seconded by Major General de Lafayette gave their final assault against the British army on 14 October 1781. On 19 October 1781, Cornwallis’ formal surrender at Yorktown brought the American Revolution to a close. Although the war did not end with the victory at Yorktown, King George III had to come to realize that it was it the best interest of Great Britain to negotiate with the American colonists and concede the independence of the Thirteen Colonies. Peace negotiations were held during which the British and the Americans signed preliminary articles for a peace agreement. The Treaties of Paris and Peace of Paris signed on 3 September 1783 put an end to the American War of Independence as Great Britain formally recognized the “United States of America”.